Dental Implants are placed by our Board Certified Periodontists and restored by Dr. Reuven Mohl in our location making it very convenient that all is performed under one roof at West Side Gentle Dental at 215 West 90th Street, New York NY. Implants are becoming a more popular alternative to dentures and bridges, restoring your smile easily and effectively. As the most advanced solution for your missing teeth, implants will allow you to talk, eat, and smile naturally and with confidence. Besides their natural appearance, implants offer the advantages of improved comfort and unequaled convenience. If you're looking for implant dental work in the Manhattan area, trust New York City's most trusted dentist in NY Smile Specialists. We can discuss any considerations and assist you in making the right decision for your needs. Dr. Reuven Mohl and his dental team place restore dental implants in his Upper West Side dental office in Manhattan, New York. All dental implants are not the same. Depending on how big the implant itself is, it will be classified as either a standard dental implant or a mini dental implant, which is sometimes also called a denture implant. 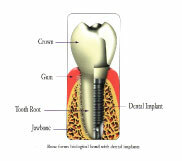 A mini implant is smaller and thinner than a regular dental implant. In addition, mini tooth implants are also considerably more affordable. The mini dental implant system consists of a miniature titanium implant that acts like the root of your tooth and a retaining fixture that is incorporated into the base of the replacement tooth, or denture. The head of the implant is shaped like a ball, and the retaining fixture acts like a socket that contains a rubber O-ring. The O ring snaps over the ball when the denture is seated and holds the denture at a predetermined level of force. When seated, the denture gently rests on the gum tissue. Placement of the mini dental implants is accomplished quickly and easily in a process performed in our office. The procedure generally takes around 1 to 2 hours. 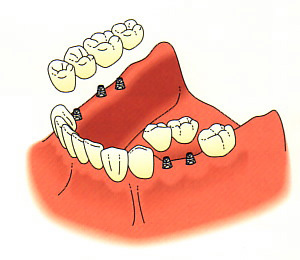 Using a precise, controlled, minimally invasive surgical technique, the implants are placed into the jawbone. The heads of the implants protrude from the gum tissue, providing a strong, solid foundation for securing the dentures. It is a one-step procedure that takes less time and heals faster than standard implants. Please call us for an evaluation at 212-595-4832 to see us at our Upper West Side, Manhattan office. Dental Implants are an excellent way to replace a missing or broken teeth. They are reliable, strong, and easy to maintain. The use of dental implants is now the standard of care for missing teeth, denture replacement, and cosmetic dental care. They can be used for single tooth replacements, or multiple teeth replacements. In either case, the result is a dramatic improvement in your chewing ability, oral health, and smile. Dental implants are very effective on the lower arch, where a removable partial denture might be considered. By using implants, a better bite is possible, as well as better stimulation to the bone. Here is an example of how a lower implant case might look. Finally, dental implants can be used to replace a full lower denture. By replacing dentures with implants, patients benefit from improved retention, chewing, esthetics and bone density. Dental implants have definitely come of age. Success rates are approaching 100%, and dentists are replacing everything from single teeth to whole arches of missing teeth. Please call our office for a consultation at 212-595-4382.